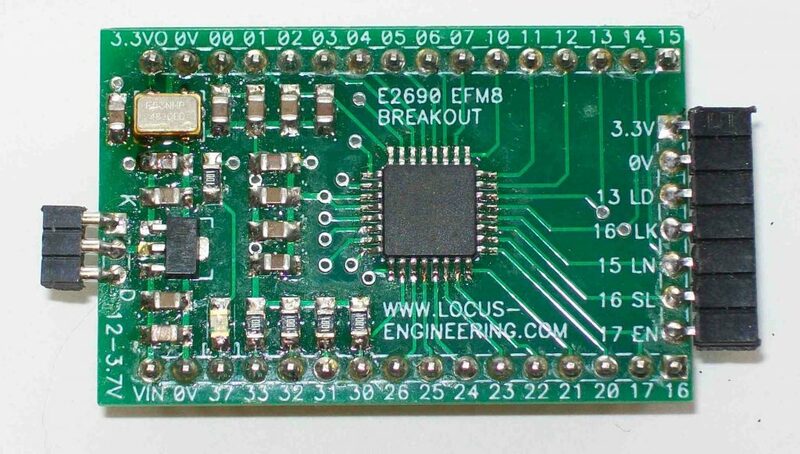 E2690 EFM8BB31F64G Microcontroller Breakout Board | Locus Engineering Inc. The E2690 Silicon Labs™ EFM8BB31F64G Microcontroller Breakout Board uses a low cost, high performance mixed signal 8051 architecture EFM8BB31F64G microcontroller on a simple to use board including voltage regulator, test LED, and C2 program interface. All port I/O pins are available and a connector is provided for the Locus Engineering E1832 Display Switch Interface. An optional external oscillator is available for more accurate timing requirements. This development board is ideal for mixed signal projects as it includes analog multiplexer, ADC, DACs, and reference voltages.